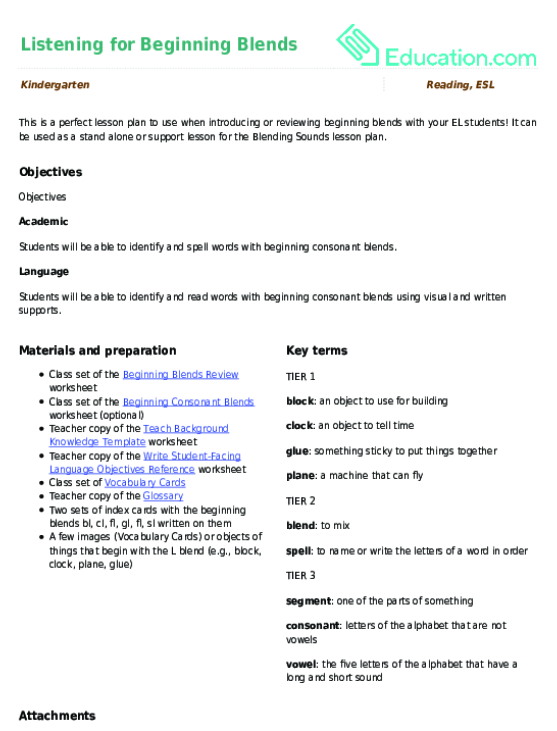 This lesson can be used as a pre-lesson for the Letter Roll Reading: Blending SoundsLesson plan. 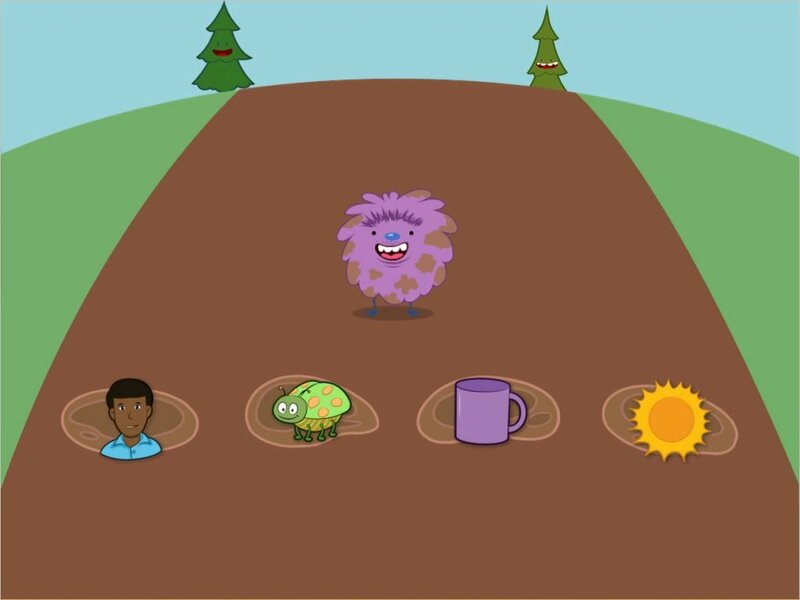 Students will be able to blend letter sounds together to create basic words. 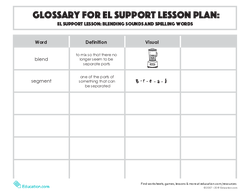 Students will be able to identify the beginning sound in grade-level words using written supports. Introduce the lesson by posting three colored sticky notes on the board (Red-White-Red) and saying, "Today we are going to practise sounding out words with three letters. Remember that letters represent sounds and when we put those sounds together, we get a word. When we sound out today's words, we are going to listen for each letter sound and then put all of the sounds together to read our word. These sticky notes are going to represent our letters, consonant-vowel-consonant or CVC words." 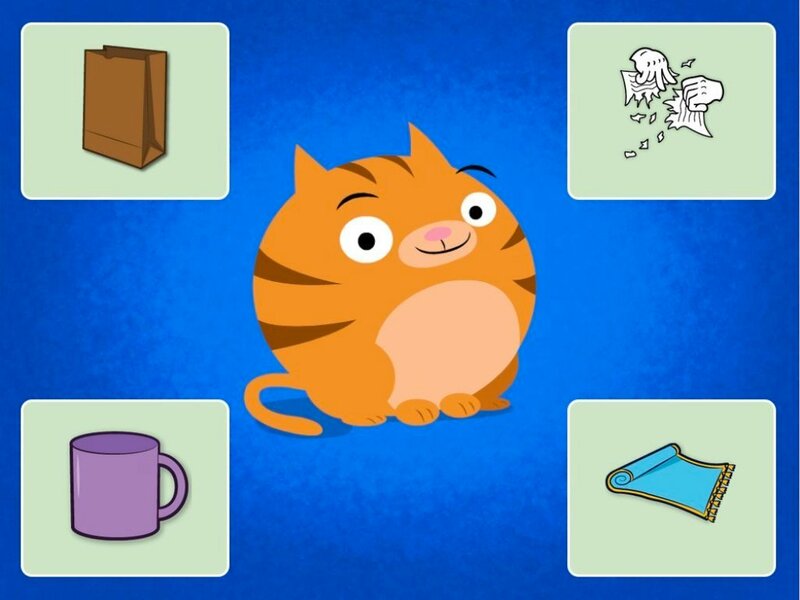 Introduce new vocabulary words using the visual Vocabulary Cards and the Glossary for reference. 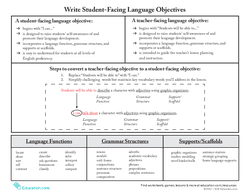 Provide student-friendly definitions in both English and home language (L1) if possible. 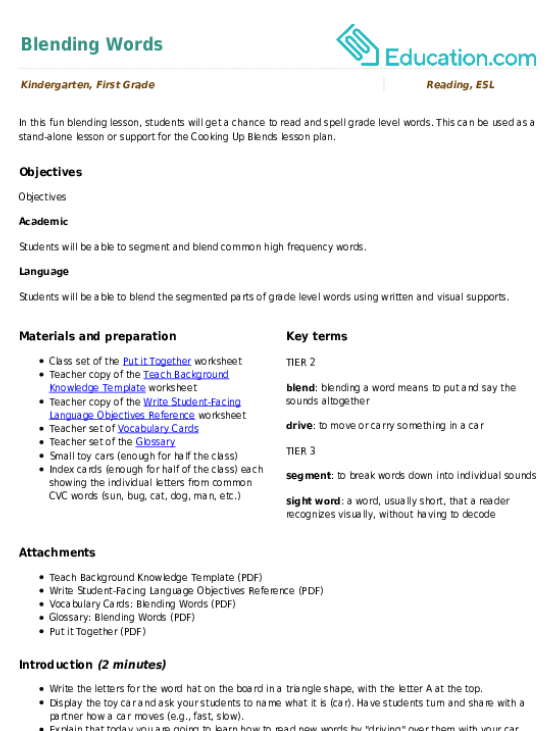 Review which letters are vowels and which are consonants by going over all 26 letters of the alphabet with the class naming all of the consonants and then vowels. Say the word, "sun" aloud and then point to the first sticky note and model saying the sound /sss/ (not the letter name) aloud, while clapping once for the letter S. Continue with the remaining two sticky notes, clapping once for /uuu/ and /nnn/. Model putting the sounds together, by sliding your hands together while saying the sounds as complete word. Repeat this process with a new word (e.g., cat) and have the students follow along (clapping and then sliding their hands together) to blend the new word. Say a new word and have students turn to a partner to practise clapping and sliding their hands to blend together the new word. Pause to check that students are all able to blend the word. Then, have them each verbally share a sentence using the new word. Repeat this process with additional words as time allows. Tell the students that now you will call up several students to clap and slide a word in front of the class. Ask for a student volunteer, have them come up and then say their CVC word aloud (e.g., dog) and have them show how to clap for the three sounds /ddd/ then /ooo/ and finally /ggg/ before sliding the whole word together, /dog/. 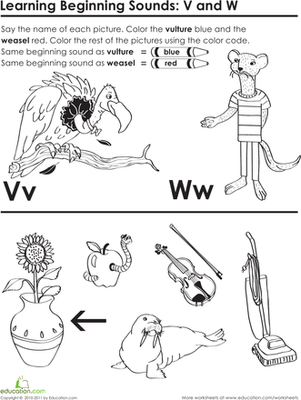 Pass out an illustrated alphabet chart to support students who need help with identifying letter-sound correspondance. 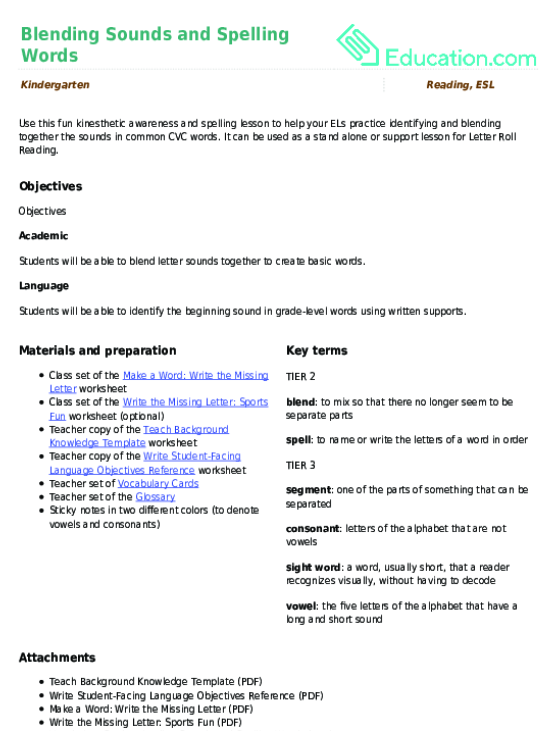 Have students practise the clap and slide method for longer and more complicated words. 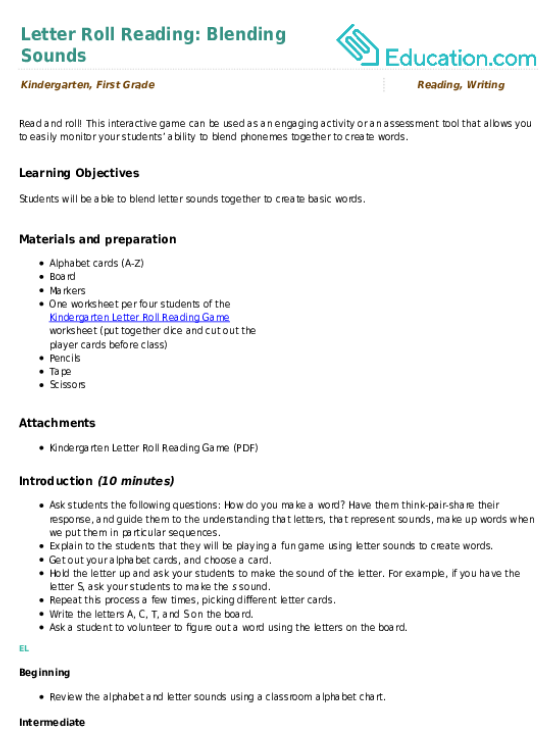 Pass out the Write the Missing Letter: Sports Fun for students to complete. 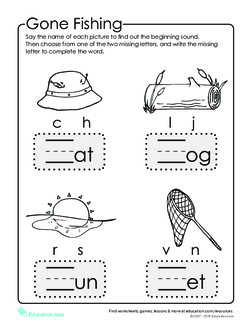 Pass out the Make a Word: Write the Missing Letter worksheet to each student and explain that they will be filling in the missing beginning letter and then blending the whole word together, using the clap and slide method you practiced as a group. 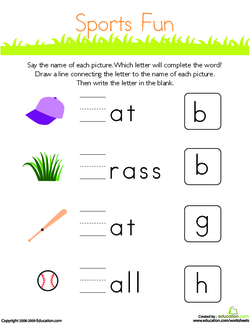 Circulate around the room as students are at work to assess if they are able to identify the missing letter and accurately read each word by blending the letter sounds together. Gather the class back together and review how to clap and slide to blend the segmented sounds of a word together. Remind the class that this new method is a great way for them to practise identifying and reading new CVC words. 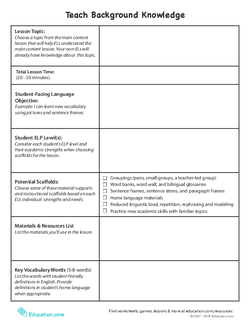 Use this assessment to check your students’ abilities to blend sounds into words. During this activity, your student will practise reading digraphs, blending the word, writing it and then reading it again. Kids decide as they colour all W words red and V words blue. 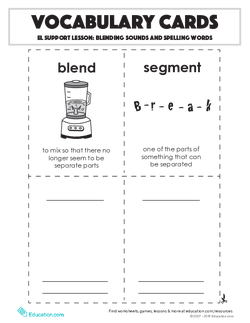 Can be used as a stand alone or support lesson for the **Blending Sounds** lesson plan.